Want to be a "CCF Lifesaver" - save a friend's life by giving away free training with us! Save a life through CrossFit, how do you mean? Moving your body. For many "desk jockeys" that spend a lot of time in front of a computer all day long this is vital for a healthier lifestyle and can allow us to play with our grandchildren on the beach when we are 70.. Eating healthy. This often turns into weight loss and changes in body composition that has dramatic effects on our members wellbeing, and may often lead into turning diseases such as diabetes around! Growing Confidence. As silly as it sounds, being able to do the stuff we do makes our members believe in themselves. This can very often be the difference between living an exciting life or not. Without getting too soppy, you'd be surprised by how many of our members admit to us that we have "completely changed their lives" - and if you have ever convinced a friend or family member to test us out you'll also know about the amazing gratitude that we all have for those that first introduced us to CrossFit! Ok, so what's this "CCF Lifesaver" thingy? For the next 8 weeks we will allow all our Cape CrossFit members to sign up as many friends and family members as they can to complete our New 6 Session Basics Course - For FREE! Every CCF member that has at least ONE* of their referred friends completing the entire 6 sessions of the Basics Course gets their own "CCF Lifesaver" T-shirt/Vest: This is a draft, original will be very similar and can only be earned through this campaign - these shirts will NOT be offered to purchase. And on top of this, the member that has the most friends going through the entire Basics Course (6 sessions) will get a Full Month of training for FREE! YOU as a member, must email us and refer your friend. "Hi, my friend Dan Bailey wants to test out this CrossFit thingy" works perfectly fine. Your friend must attend all 6 Basics Course sessions at the allocated times (PM-times in all three boxes). Once your friend has attended all 6 sessions we consider you being a Lifesaver and you will get to order your T-shirt/Vest. (Delivery will only happen after these 9 weeks are over - towards December). Your friend does NOT have to become a paying member. Your friend must complete all 6 sessions before the end of the 9 weeks (usually this is done in 3 sessions per week for 2 weeks). Your friend can not have been a previous member at CCF. The Basic Course has to be Completed by no later than by the 25th of November. 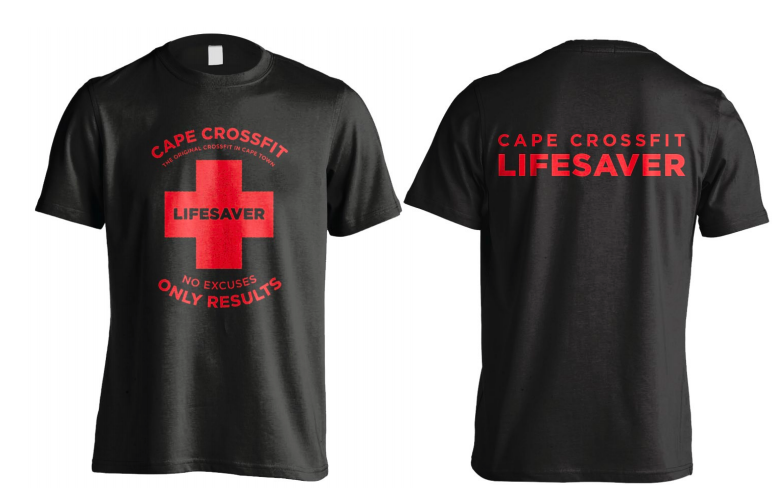 The t-shirt/vest is only valid for your first referral that finishes the Basics, for everyone else they will be counting towards your total count of "lives saved" and if you have the most at the end of the 9 weeks you'll get the free month! You can save a friends life, or in a worse case scenario give away 2 weeks of free training to someone who needs it, and you can get kitted with an epic t-shirt/vest that no one else will ever get - what are you waiting for!? Email us now with your friends details and we will book them in for the next available Basics Course!